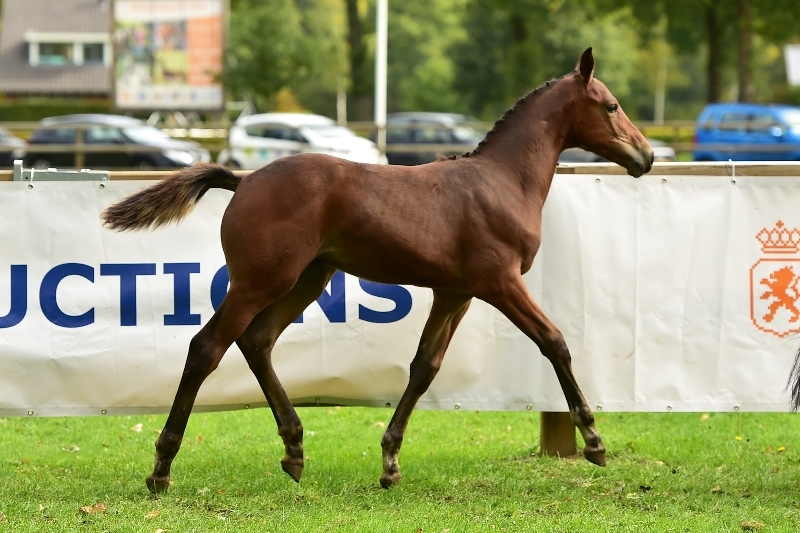 Now, that was it, the fifth and final KWPN Online foal auction of this year. With an average of 3600 euro, the auctionprize was in line with the other four auctions. Newton van de Vrendt (s.Verdi) goes into the archives as the most expensive one of this auction, for 7500 euro. Jan Lutke Willink, the breeder of this Verdi-son is very satisfied: "Newton comes from a good dam-line. The dam already gave the 1.55m jumping horse Disinaa from Rubert R. Also the Grand Prix horse Mac Kinley from Rolf Göran Bengtsson comes directly out of this line. So then, 7,500 euros is a decent price for this foal. My Highway foal Newstar fetched 4,500 euros, on average still 6,000 euros. Together with my son I have a dairy farm and in order to be able to breed, we have removed a few dairy cows. If you add that plus the stud fee, vet costs, etc. then you also need that price to be out of the costs. Although, breeding is still a hobby for us. Nothing is more beautiful to ride your own breeding products. I am now 71 years old but I still ride. Two years ago I was fourth in the Dutch championship with the dam of the Verdi-foal, Zirsinaa, in the 1.10m class." Jan continues: "My compliments to KWPN that all breeders can participate in this auction. I think it is important that breeders breed with proven dam-lines. You can see from the auction prices that these foals also yield more." About the course of events, Jan says the following: "It is very nice that you only have to come with the foal and the mare once. A KWPN inspector makes up an independent report of each foal, everyone can then call the KWPN for more information on that foal. Another plus point I think is that KWPN had provided for a veterinarian. I participated for the third time now and I think it's a fantastic way to auction foals." Most of the foals have been sold and some foals leave for foreign countries. Bidders from Belgium, Germany, Estonia, Poland and China managed to lay their hands on a few foals. For 6,500 euros Iconic B-foal Nimrod exchanged owners. Three foals fetched 5,500 euros: Nalexa (s.Glasgow-W VH Merelsnest), Niteroi A.G. (s.Guardian S) and Nevada of the West (s.Indian Rock). In addition to the Highway-foal Newstar, Nadeche (s.James Bond) also raised 4,500 euros.